We are hearing about solar power applications day in and out. Not only has solar energy helped to solve bigger power problems, but has also entered small ventures like solar karts, solar e rickshaws, solar powered chargers, lights etc. to help people in their daily lives. Another breakthrough invention specially designed for cyclists is a solar powered backpack. Lumos Design Technology Pvt Ltd. a Bangalore based firm that specializes in building energy-harnessing devices and is revolutionizing the wearable technology in India. The company has now introduced solar powered backpacks called Aster for cyclists in India. Each such backpack will be made up of flexible solar panels. These bags are designed to minimize the number of road accidents, with their rear, front and profile lights. They also have integrated turn signals that lets the drivers know when you are making a turn. These bags are comfortable to wear while on a ride, with cross straps for weight distribution and proper air flow. They come with either an in-built 4000 mAh battery or as an unplug solar backpack. The battery allows for trickle charging even at low current and can be itself recharged through a USB cord and is removable from the bag while charging. The backpack also has loops to fasten a cover on the bag, when it rains. The fabric itself is weather proof with flexible solar fabric. The price ranges between INR 4500-5500. The firm also provides international shipping and warranty. Aster also has the power to charge gadgets like smartphones, GPS devices and any other gadget that charges through a USB. We all know how soon the phone’s batteries drain out when the GPS is on. So now there is no fear of the phone’s battery getting discharged while on the ride. Each hour of sunlight gives a couple of extra hours for charging. 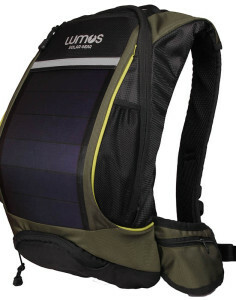 Hence this solar powered backpack is ideal for long distance commuting or trekking. There has been a strong wave of awareness about the rising levels of pollution in the Indian cities like Delhi, Mumbai and Bangalore. The level of air quality has been deteriorating at a fast pace in these cities, which has also led to a rise in the sale of air purifiers in India. As such many office goers and even students have now resorted to cycling to reach their workplaces. This trend is already at its peak in the West. People use cycles not only to reduce the air pollution caused by the fossil fuel powered cars, but also for health benefits. Buy one today! It is estimated that the global cycling market has a market size of approximately $2.5 billion. As such Lumos has a distribution network across 9 countries with 10 stores already in India. Indeed a smart bag for smart people!